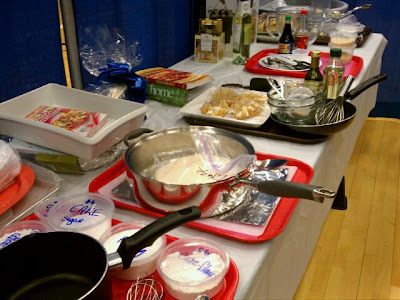 I helped with the Taste of Home show today. I've done it a few times before and it's always interesting. 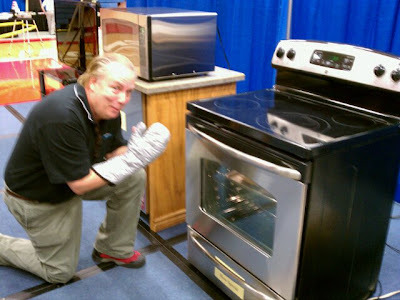 This year our culinary expert was Guy, and he was fabulous. He was so fun and funny. He made the day fun. We go in the morning and prep everything, then help during the show. It's quite an amazing process to see it all come together. There's a system for everything, but he was really easy going and everything worked perfectly. Everything gets measured and prepped in the morning so the show is just like TV food shows where things magically seem to happen quickly. The reason it happens quickly during the show is that six people spent four hours each prepping. So, lest you thought chefs had some secrets they weren't sharing, rest assured, it's much the same as it is for you and me. I was glad I got to go. I'm a tired, tired, tired girl, but it was fun. I wanted to go, but had to go to a Kanza Co-op meeting instead. I had three options for last night. I wish they hadn't fallen on the same night! Even though it was a lot of work, I'll bet the behind-the-scenes work was fun.